In what way do the Cornish kilts differ from all the other kilts that are worn across the world? The other major difference is the tartans used to make these kilts. This relatively small county situated in the South West of England boasts a Celtic heritage that dates back many centuries. How long they have been wearing kilts there is a matter of speculation, some reports suggest that they were worn as early as 1510. What is known is that among the medieval treasures of the county are carved bench ends, which can be found in Altemun and St Winnow churches. These carvings depict men dressed in what appear to be kilts, with one figure appearing to play the bagpipes. So the wearing of the Cornish kilts is well established in their Celtic heritage. The tartans which belong to the county however are not quite so old. In fact the first tartan the "Cornish National tartan" originated in 1965, its potential was quickly realized as a National dress (please bear in mind that although the county is officially a part of England, the residents see their culture and history as being separate and seek independent status). A small committee was set up, which then became a business partnership commissioning the weaving, distributing and selling of the tartan. The tartan itself was designed by Ernest Morton-Nance, and is based on traditional colours of the area. Woven into the basic scheme of gold and black (the colours of the ancient Kings) is the black and white cross of St Piran, the patron saint of tin miners. Added to this is a strong red line representing the "Chough" a local sea bird which is their National symbol, and finally an azure blue line which represents the sea. That tartan proved so successful among the locals in the county, that by the nineteen eighties kilts were proudly being worn to many gatherings, such as the St Pirans day dinner or the Gorsedd. 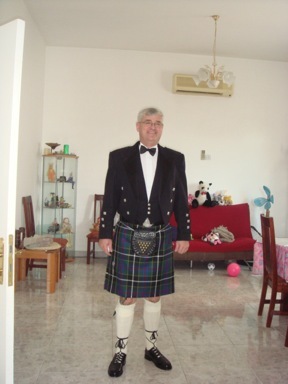 Below you can see the Cornish National tartan being worm by a proud Cornishman, who lives and works in the United Arab Emirates. Mike was kind enough to send me this photo of himself, with his wife Anna, and beautiful daughter Jessica, taken at a New Year's Eve party. You will notice that Jessica is wearing a kilt made from the same tartan as her dad, and Anna's shawl is also made from the Cornish National tartan. The next to be developed was the National day tartan in 1981, this was a softer hued version of the original National tartan, and although it still has a limited availability it is not widely seen. The Hunting tartan was introduced in 1984, designed by Sandra Redwood it provided a cloth which then made a darker kilt, which many people prefer. Again Mike was kind enough to send me a photo of himself, this time wearing his Cornish hunting kilt. If you would care to see more photos of Mike in his kilts, then please visit the Your Kilt Photos page. The fourth National tartan to be developed was the St Piran dress tartan, also in 1984. This one is based firmly on the flag of St Piran, so is fundamentally black and white. However the deep red line representing the Chough is evident, along with two lines of dark green which represent the commonly held belief that St Piran arrived from Ireland on a millstone. The popularity of the kilt in the area over the last twenty something years has led to the development of a few family tartans, and the numbers are steadily growing. There are however very few of these tartans available to the general public, as the designs are often being kept exclusively for close family members of the designers. So as you can see the wearing of the kilt is flourishing in this relatively small South West corner of the British Isles, as it is throughout the world. If you would like more information on Cornish kilts, then drop me a line using the Contact Us page, I will be delighted to answer any questions you may have.